A puppeteer (Sean Harris) returns home. The only thing left for him there is a stepfather (Alun Armstrong) and his mother gone. Disgraced from the atrocity of his own creation. Home is the only thing he knows besides the soft insides of a puppeteer’s life. Why did he have to show it to the children? With his brown bag in hand he plans to rid himself of this abomination, that’s ruined his life so he can find salvation. You can’t kill it, it’s a puppet. Still it seems to keep getting out at the worst of times. He’s taken it to the woods but he can’t seem to leave it behind. It always returns home, just like him. With the head of a man, his own head and the body of a spider, he’ll throw it in the stream but it won’t float away. It returns to him by night each and every day. His own face haunts him at night in the darkest of his dreams, he awakes with it there watching his screams. People are going missing, who’s to blame? Is it Possum? Is he insane? Though he’s told to kill it, it’s a puppet without life. How can you kill that which cannot die? Facing your past you must look at yourself in a mirror. It doesn’t have to be glass, the reflection in a puppet couldn’t be any clearer. When all else fails and you tire of fight, you must let it consume you so you'll be alright. Face your nightmares. A boy becomes a man and a man becomes a Possum. Veteran actors Sean Harris and Alun Armstrong give chilling performances in this desolate psychological horror. Impoverished settings and a truly horrid creation of nightmares offer a supernatural element to real world horrors. Everything in the debut directorial feature of Matthew Holness is eerie. I love the literal culmination to the ambiguous telling of a simple story. It feels like 70’s British horror from a time when storytelling was still meaningful and done well. Sub-genres of horror usually have one great film per year. 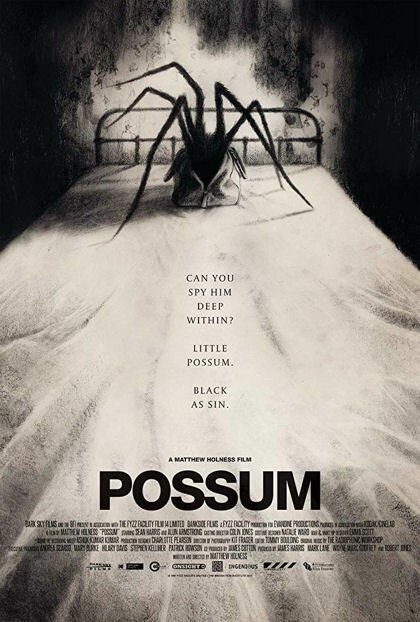 Possum is it for Psychological Horror in 2018. An excellent film.